It's true: Israeli Prime Minister Benjamin Netanyahu stood before Congress and cast a critical lens on the Iranian nuclear deal being cooked up in Washington. Yet, despite President Obama's assertion that "there was nothing new" in the speech and that "the prime minister didn't offer any viable alternatives," the Israeli leader actually did propose some reasonable options that bear consideration. The first is making the "sunset clause" conditional upon Iranian behavior, not an arbitrary timetable. The current terms under discussion call for a deal that would expire in around 10 years, at which point Iran would be allowed to operate an unlimited number of centrifuges, of unlimited sophistication, to enrich an unlimited amount of uranium. The narrow focus on Iran's nuclear program in the current grand bargain misses the reality that this issue is but the latest bone of contention between Iran and the West. Without nuclear weapons, Iran is still the foremost sponsor of international terrorism with terrorist networks active on five continents. With its recent expansion through terrorist proxies, Tehran now controls four Arab capitals in Lebanon, Syria, Iraq, and Yemen. Without a definitive change in the regime's behavior, other Arab states won't wait around until the deal expires to acquire their own nuclear capabilities. The Middle East nuclear arms race would begin in earnest immediately. Therefore, any sunset provision should be behavior-based, not time-based. 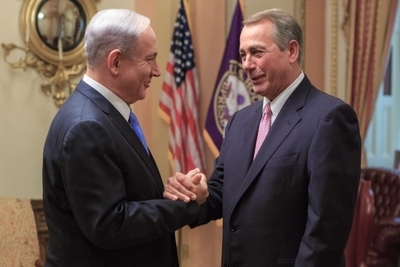 The Israeli leader also raised the issue of verifying Iran's compliance with a deal. This is especially important given that Iran's past nuclear efforts have largely been clandestine or undeclared. The International Atomic Energy Agency (IAEA) can only report—not prevent or punish—violations of the agreement. And that's only if the nuclear watchdog knows the full breadth of Iran's nuclear program and has unfettered access to any site it chooses. Just this month the IAEA, declared—not for the first time—that Iran was being dilatory in its cooperation with the agency. What about violations? If the central point of an agreement is deterrence, then the penalties need to be agreed upon upfront, not debated as they occur, or worse, debated if they even happened depending on how one reads the deal. Another point Netanyahu raised was the size and scope of the nuclear infrastructure Iran would be permitted to keep. The current discussions would allow for Iran to operate around 6,500 centrifuges, but according to the IAEA former deputy director-general, Olli Heinonen, that number goes well beyond what is needed for civilian applications. This issue involves a combination of the number and quality of the centrifuges, their output, and the percentage of enrichment allowed. Finding the right number gets to the heart of the agreement as the only argument in favor of the deal that holds any water is that it would keep Iran at least one year away from being able to breakout toward nuclear weaponization—at least during the period of the agreement. That leads to another problem, which is that American and Israeli intelligence assessments differ over how fast Iran would be able to race toward a nuclear weapon. Netanyahu described the discrepancy as "about a year by U.S. assessment, even shorter by Israel's." The difference is key because according to U.S. officials, the deal is designed to allow Iran to become a nuclear threshold state, just a year away from making the plunge if it decided to break off the agreement. As Robert Satloff, Executive Director of The Washington Institute for Near East Policy pointed out, it is questionable whether U.S. analysts can know with certainty if Iran's breakout capability is really one year. Indeed, given the aspects of the program not covered by the agreement, it is unlikely that a year of warning time would remain after three, five, or ten years of the deal. To allay the concerns of critics, the White House might offer Israel a "nuclear guarantee" as former American envoy to Israel, Martin Indyk suggested. But such an offer is undercut by the perception that the U.S. is retreating from the region, doesn't honor its international commitments, and does not enforce its own red lines such as those drawn in Syria. And why would Israel put its survival in American hands, especially with an administration that has proven so publicly hostile toward the Jewish state? America's word is not what it used to be. Prime Minister Netanyahu offered some important suggestions: Scrap the "sunset clause" or at least make it conditional upon Iranian behavior; work out a verification regime of Iran's compliance that stands a chance of working and; minimize the size and scope of Iran's nuclear program beyond what's currently being considered. These ideas should be seriously considered and deserve more than partisan attacks based on the process, politics, and tactics leading up to the speech. After White House officials described the Obama Doctrine as "don't do stupid stuff," the president elaborated, saying that he is swinging for singles and doubles, and "every once in a while we might be able to hit a home run." As he said, "it avoids errors." In the Middle East, however, the president has yet to reach first base. Before swinging for the fences, he would do well to explain to the American people how the deal he is considering would actually prevent Iran from getting a nuclear weapon.